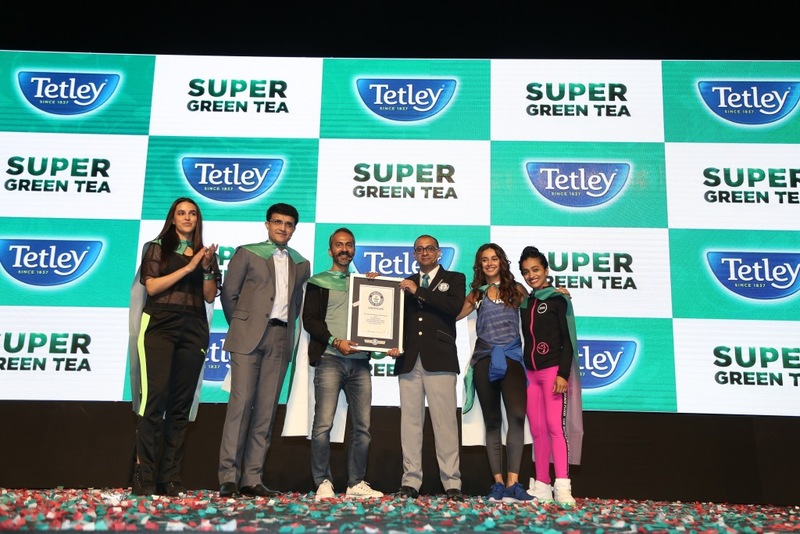 Tata Global Beverages launched a new range of Tetley Super Green Teas under their Tetley portfolio at a GUINNESS WORLD RECORDS® record-setting event at NSCI in Mumbai today. At a Zumba concert today, led by the new face of Tetley in India – Sourav Ganguly, actress Neha Dhupia, actor and presenter Shibani Dandekar and renowned Zumba Education Specialist, Shwetambari Shetty along with 2000 people in capes set the GUINNESS WORLD RECORDS® record for the largest gathering of people wearing capes, amidst much fanfare. It was a remarkable sight as people from different walks of life came together under one roof to celebrate the spirit of ‘Everyday Super Humans’. After pioneering the green tea wave in India, Tata Global Beverages, the second largest tea brand in the world, introduces a first-of-its-kind vitamin-enhanced range of Super Green Teas as the latest addition to the company’s green tea portfolio. The company has always pushed the envelope when it comes to innovation, aiming to offer consumers products that suit their changing needs, evolving tastes, and varying lifestyles. This journey of innovation has led to the creation of Tetley Super Green Tea which caters to those people who are faced with Super Human expectations every day. Taking one of the world’s healthiest beverages to the next level with added vitamin-enhanced benefits, Tetley Super Green Tea is truly the ‘super hero’ of green teas. The Tetley Super Green range consists of Tetley Super Green Boost – a combination of lime and mint green tea with vitamin B6 to help reduce tiredness and fatigue and Tetley Super Green Immune – which is a combination of citrus and honey green tea with Vitamin C, to help support the immune system.